Nowadays you can’t have enough storage when riding long distances. 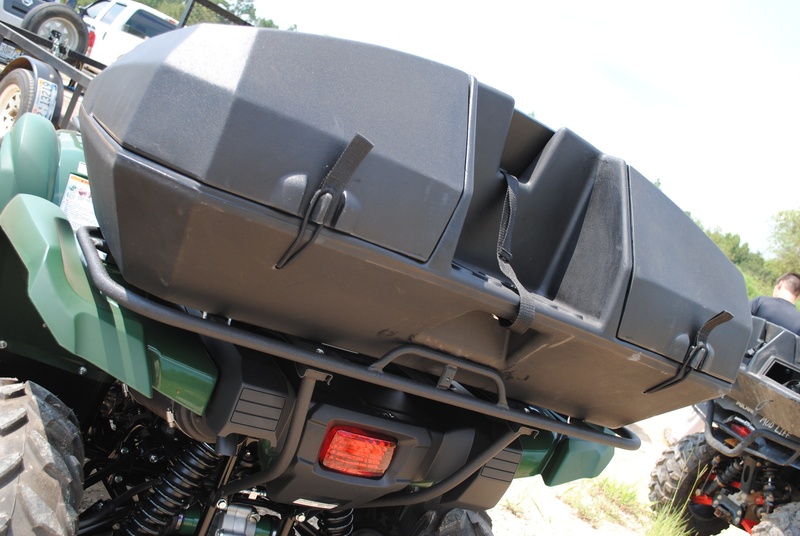 ATV manufacturers have been increasing the amount of dry storage found on most units but sometimes you just need more. There is no limit to the things a rider could or should take. 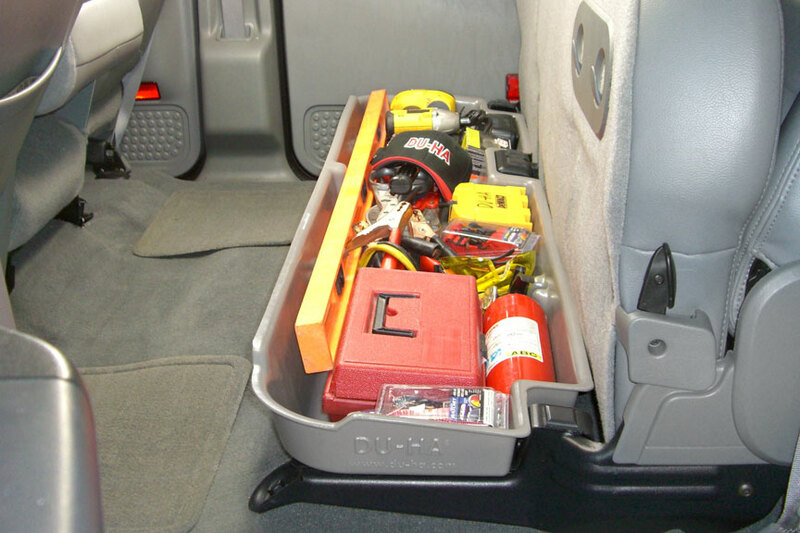 Smart carry-ons include first aid kits, air compressors and tire kits, belts, a jacket, snacks and drinks, tools and any number of items specific to your riding environment and conditions. With the adventures we tend to get into we decided it was time to get one ourselves. 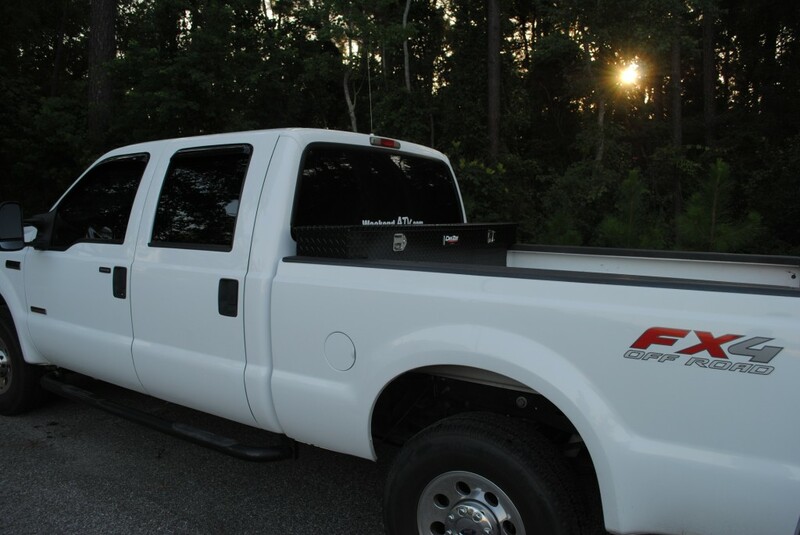 We picked up a couple of Quadboss Weekender Trunks at Halls Motorsports in Mobile, Alabama. The Quadboss Weekender is a hard plastic storage trunk. It has a large amount of storage space internally and a shelf on which to strap a small cooler or fuel can. The Weekender also adds a comfortable cushioned seat. Quadboss Weekender Trunk. Quadboss stock photo. Mounting the trunk is accomplished using four U bolts and wing nuts. 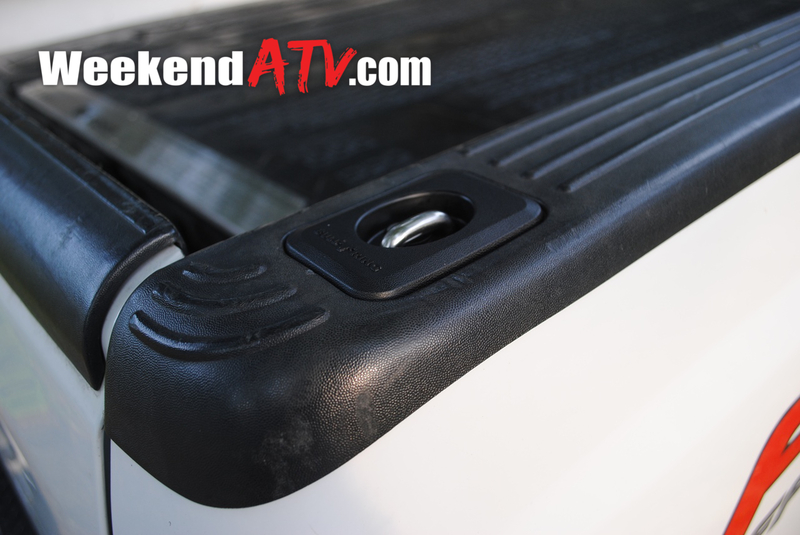 It’s designed to be pretty universal so you’ll have to drill your own mounting holes in the trunk. 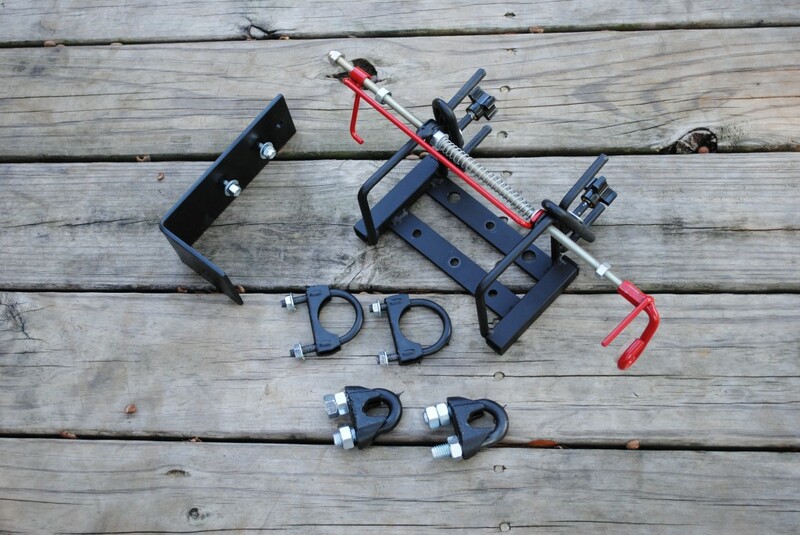 You may find it’s best to remove the rear rack to help make marking the mounting holes easier. 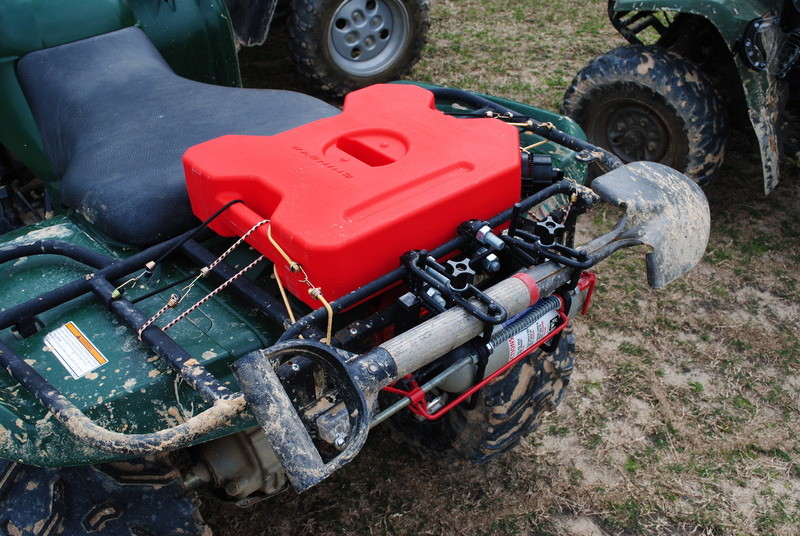 We found that mounting it to our Polaris rear rack was a bit of a pain thanks to the Polaris rack design, but it is quite secure once in place. Installation on the Yamaha Grizzly was much easier. 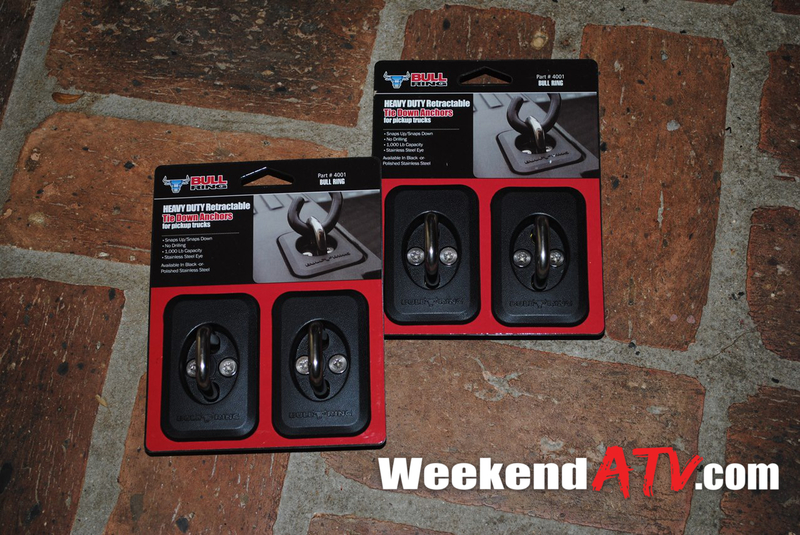 Remember to frequently check the wing nuts and tighten them up as needed. 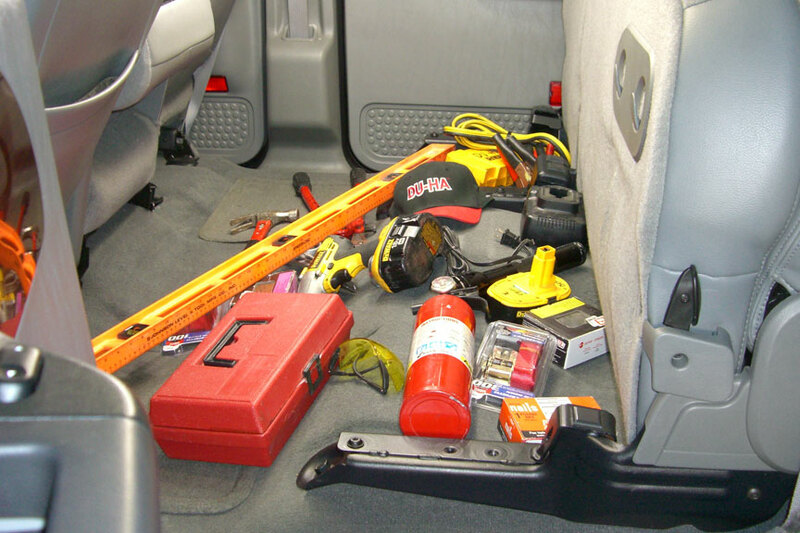 Be sure to check the fit with the driver in place to make sure the trunk is not mounted too far forward. 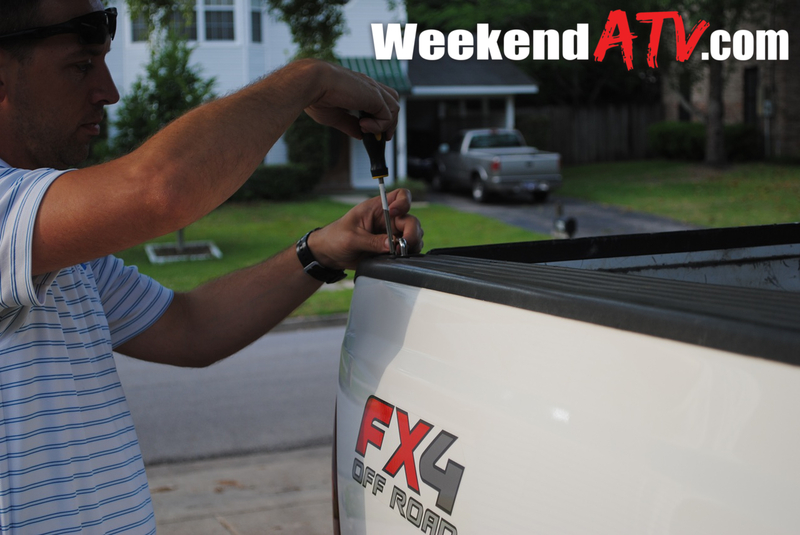 Unfortunately, the Weekender is so long that is can be hard to get proper placement for the driver without modification to the rear rack. 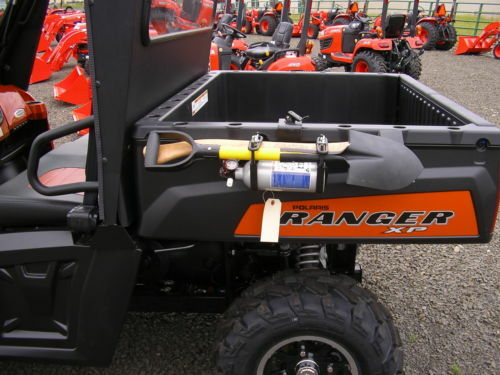 In both our Grizzly and Hawkeye installs we found that placing the trunk in front of the lip on the back of the rear rack placed it too far forward to be comfortable for long rides. We cut the plastic lip off the Hawkeye rack. On the other hand, the bottom seat cushion is removable, held in place by just velcro. Looking at the Weekender you would expect it to serve as a passenger seat. 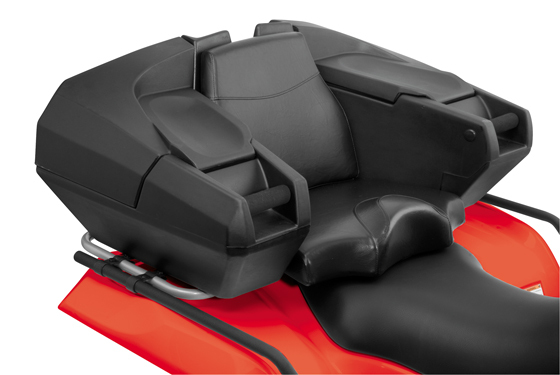 Afterall, it has plush back and bottom cushions, comfortable hand holds and sits back too far to be used by the driver. 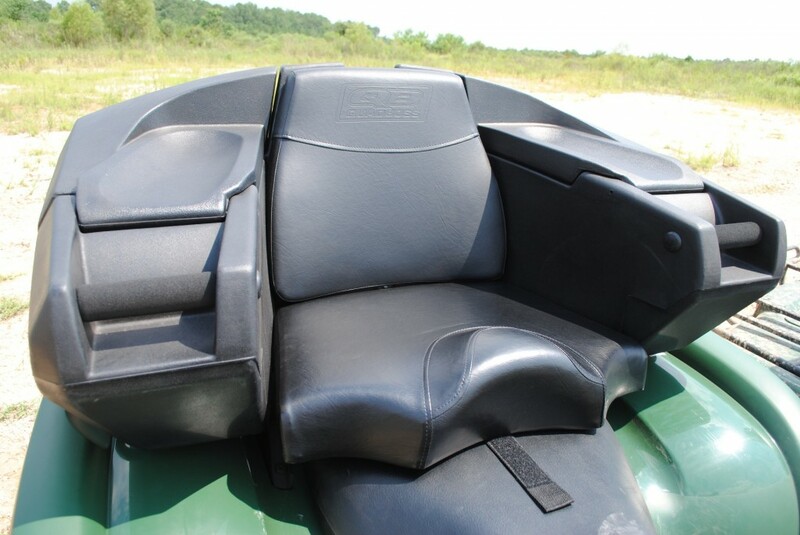 However, Quadboss disclaims that it is “not for passenger use while operating vehicle.” I would imagine this is for their own protection from mis-use, improper installation and driver stupidity. Most parks will probably enforce their passenger rules against this seat as well, too. However, there is some level of expectation that it will serve as a passenger seat at times. In controlled tests it worked well, but it certainly pushes a single passenger ATV beyond its designed limits, especially on inclines and sidehills. 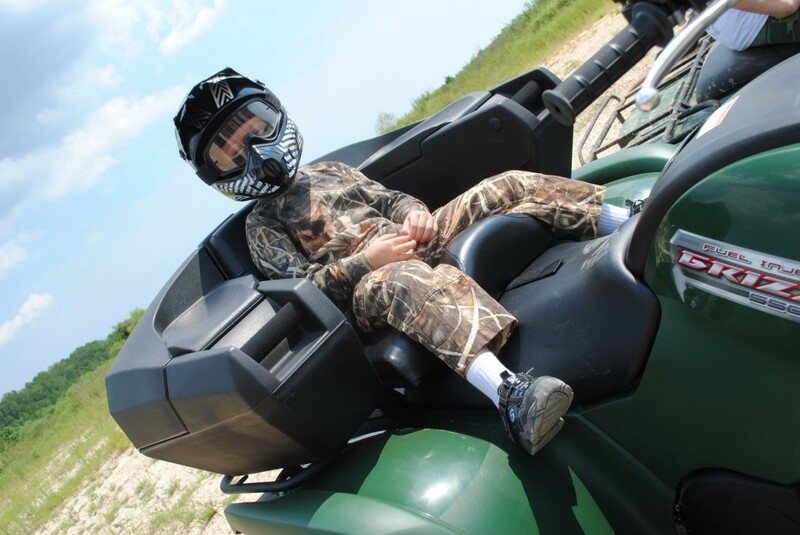 It makes a comfortable spot for a small passenger, but if your need is to have a place for a constant second rider, there are plenty of 2-up ATV’s that will accomplish this much easier and safer. Most comfortable seat in the house for sure! 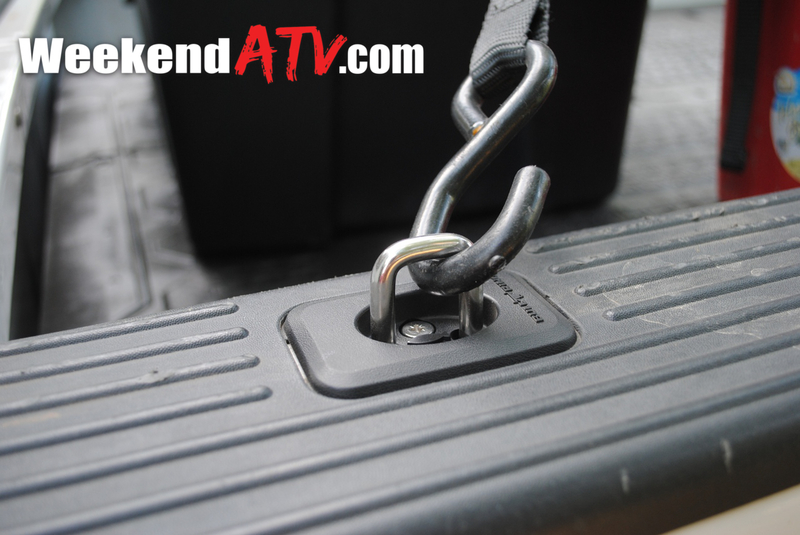 Disclaimer: Neither Quadboss nor WeekendATV.com condone using the Weekender as a passenger seat. Always heed manufacturer warnings. The Weekender opens up on both sides. It opens from the rear so access while seated is a bit difficult. The elastic cords work well for holding the trunk doors closed. The openings measure (get measurements). It’s not quite big enough for most adult sized helmets, but youth helmets will fit inside nicely. It would have been nice if they had included padlock holes so you could lock the trunk. 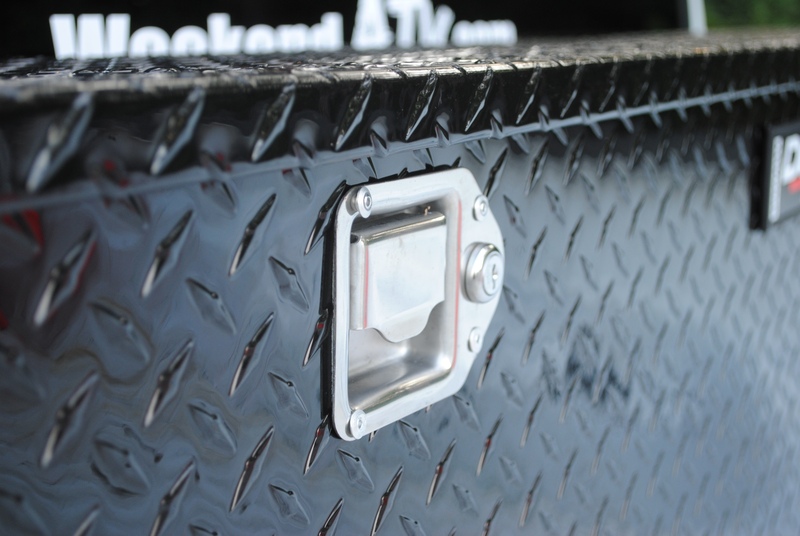 The design of the openings is pretty water-resistant thanks to the lip it has. 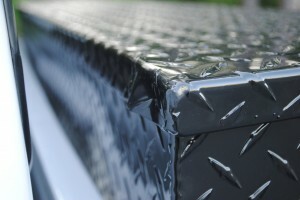 It would be easy to add a little foam water-proofing strip to the edge if you need. 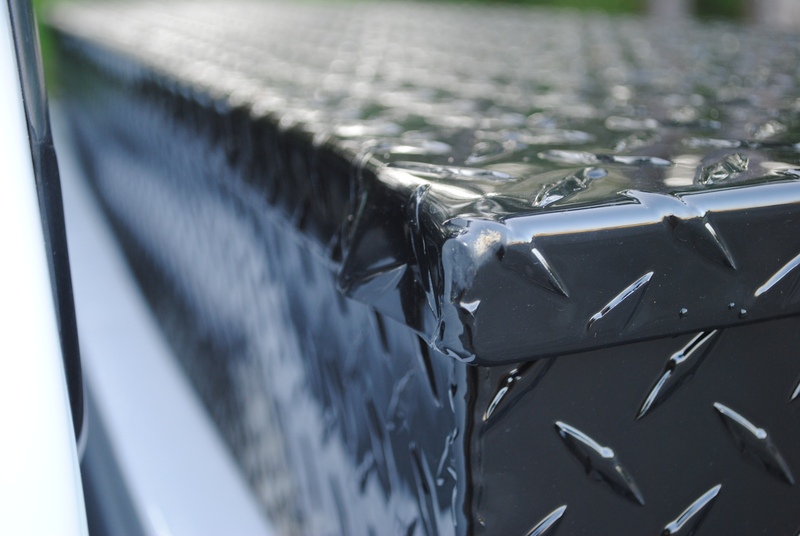 The Weekender has a textured finish that helps keep scratches from being too visible. 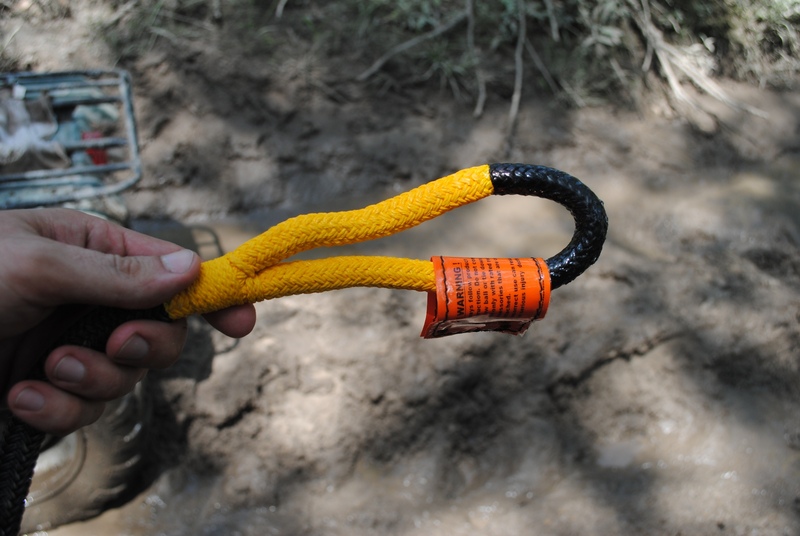 This is especially good on tight trails. 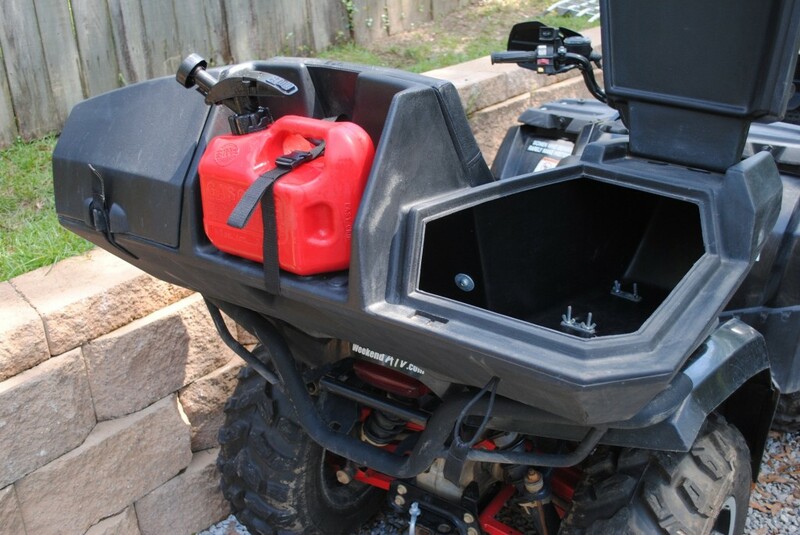 The size of the Weekender makes it as wide or wider on some ATVs, and you may find that it gets hung up on branches and vines that the ATV itself easily clears. 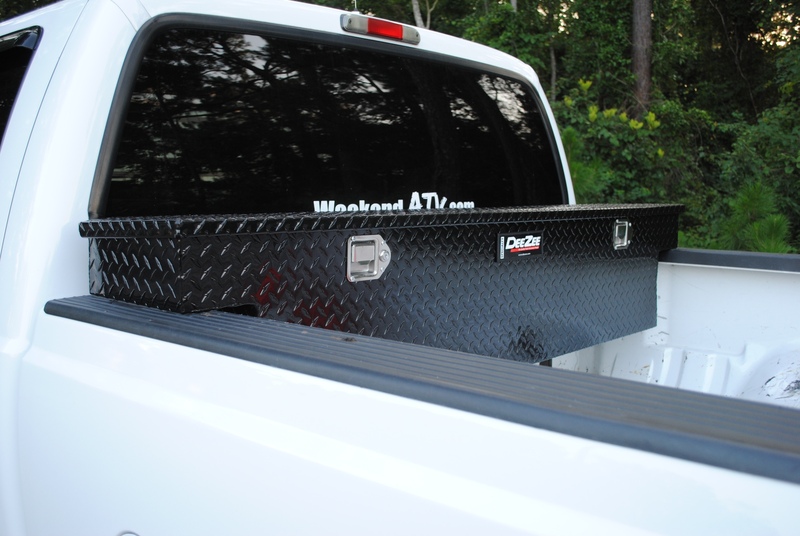 Overall, the Quadboss Weekender Trunk is a solid accessory. An MSRP of $333.99 may be a little steep for a plastic box, but its pretty well inline with other industry-specific offerings. 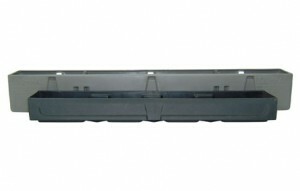 Dealers should also be able to provide a full line of replacements parts. 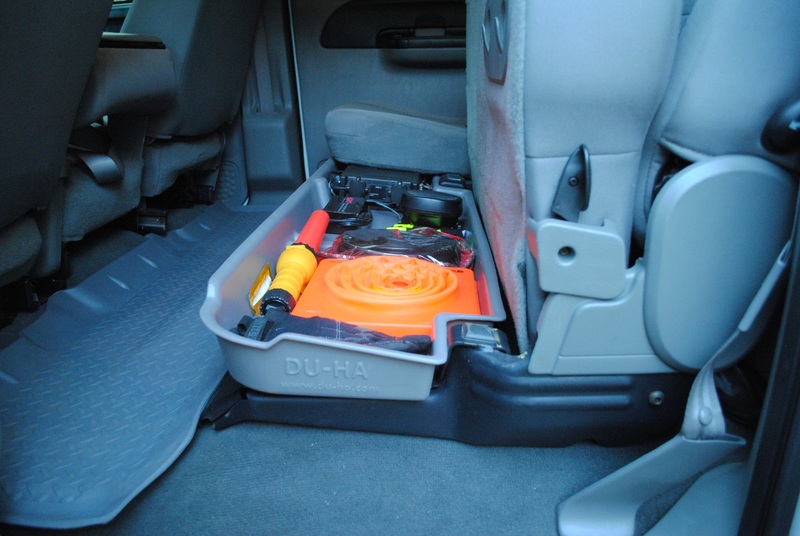 This may come in handy if you forget to remove the seat cushion before heading down the highway. And no, we haven’t had that happen yet. 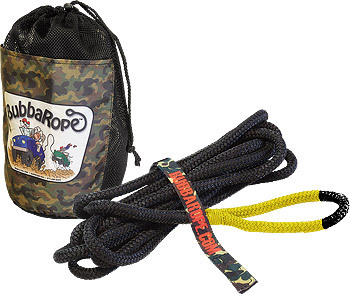 To find a Quadboss dealer near you or to see other trunks they offer check out the Quadboss website at http://www.quadboss.com. If you are on the Gulf Coast check out the Hall’s Motorsports locations at http://www.visithalls.com.